Zoo rescue in the Gaza Strip. 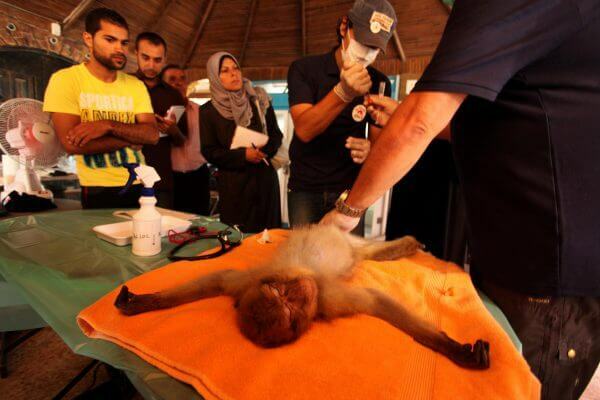 Animals rescued from zoo in Gaza as foreign veterinarians intervene to help avoid an animal disaster. Israel’s embargoed has produced disastrous consequences not only for the human residents of the sea coast strip but also for the animals in the zoo. Photo report from the Gaza Strip: Animal rights activists intervened recently to provide care and support for the animals at the Zoo in Khan Younis in the Gaza Strip. The ability to care for the animals at the zoo has been impaired by the stringent embargo imposed by Israel’s military which has shut out the Gaza Strip from receiving commodities and needed products from the outside world. Four Paws International issued a call for support in 2014 to help the animals at the Gaza Zoo. Four Paws International issued an alert in January calling on international support to intervene to help the animals. Since September 2014, FOUR PAWS has undertaken several successful emergency missions in the Gaza Strip. Our first mission involved providing emergency relief to the Al-Bisan Zoo, located in the northern part of Gaza. The FOUR PAWS team provided food and veterinary services, helped improve the enclosures, and trained zoo staff to care for the remaining animals. One lioness and two male lions were also rescued by our team from the heavily-damaged facility and transported to a sanctuary in Jordan. In April 2015, FOUR PAWS responded to another zoo, this time in the south of Gaza named the Khan Younis Zoo. This desolate zoo had been widely reported by media as “the worst zoo in the world” after pictures emerged of animals at the zoo that had starved to death and been mummified for display by the zoo’s owner. 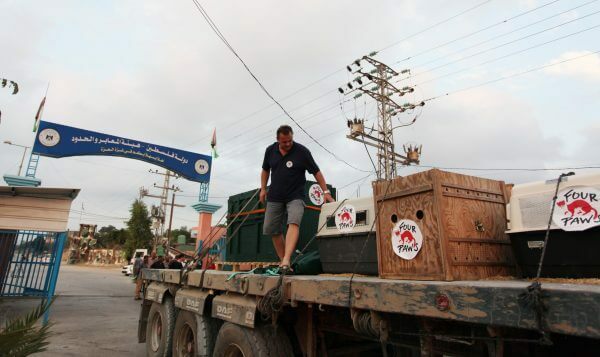 As the only animal welfare organization to be granted official permission to enter the conflict region, the FOUR PAWS team provided veterinary care for the animals and organized emergency medical care and food for the zoo for three months. Later in 2015, FOUR PAWS again became active in the region by rescuing two lion cubs that were living as pets in a refugee camp in Rafah and transferring them to the Al Ma’wa for Nature and Wildlife sanctuary in Jordan, made possible by a collaboration with the Princess Alia Foundation. Accomplishing these missions is no easy feat and requires a lot of planning, patience, and perseverance. It is extremely difficult to enter the region and very dangerous to work in such an active area of unrest and conflict. FOUR PAWS must work with local governments, non-governmental organizations (NGOs), and various officials and representatives from Israel, Egypt, Jordan, and Palestine to be granted the numerous permissions, permits, and certificates required for these transnational rescue missions to occur. Funding the necessary medical, personnel, documentation, and equipment requirements to transport animals across country borders is also a major undertaking and could not happen without the important financial support from our members and donors. 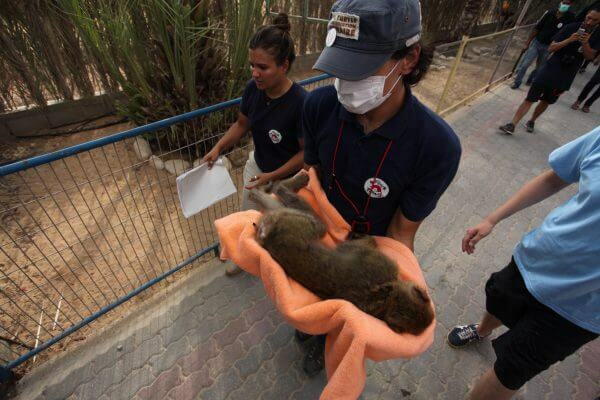 A member of Four Paws International team carries a sedated monkey before it is taken out of Gaza, at a zoo in Khan Younis in the southern Gaza Strip August 23, 2016. A team of foreign veterinarians are evacuating the last surviving animals from a zoo in the Gaza Strip that had been dubbed ”the world’s worst. The Egyptian doctor Amir Khalil, a member of the organization’s delegation, told reporters in Gaza, said that the animals will be transferred to the protectorates nature reserves in South Africa and Jordan. Khalil said that this step comes after a medical examination of the animals proved to be suffering from mental disorders, in addition to the deaths of a number of animals from violence and hunger. THIS POST HAS BEEN READ 33347 TIMES SO FAR. THANK YOU! Mohammed Asad is a photo journalist based in the Gaza Strip. Friend him on Facebook at https://www.facebook.com/mohammed.asad.90. photographer Mohammed Asad's photo of Dalia Khalifa won an award in March 2015 at a competition organised by the UN. 'Unbreakable' - is the photo of 9yr old Dalia Khalifa, taken at Al-Shifa Hospital on Aug 9th, 2014. Dalia was badly injured in an Israeli air strike during Operation 'Protective Edge'. 'Unbreakable' is the Grand Jury Winner in the photography competition, organised by the United Nations Office for the Coordination of Humanitarian Affairs in the Middle East and North Africa (UN OCHA).